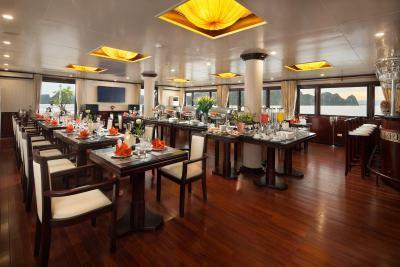 Lock in a great price for Halong Silversea Cruise – rated 8.8 by recent guests! Great communication. Facilities great, well organised, very helpful and friendly staff. Food was excellent and exceeded expectations. On board prices for drinks was not exorbitant so didn't impinge on our budget or limit ourselves. Would definitely recommend Silverseas as value for money. Food was excellent and so much. Well organised tour considering the volume of tourists. Beds comfortable. 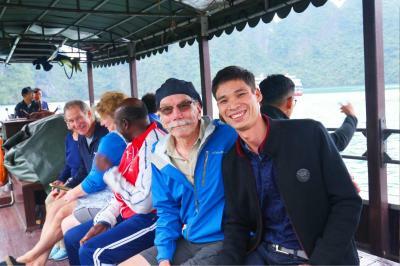 Enjoyed the experience on a junk in Halong Bay. 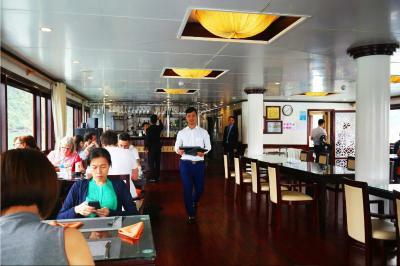 Staff created a good atmosphere and were attentive. The food was good. The scenery is gorgeous and a must see. Tour guide was good and very helpful (Phon). The crew was very polite and good. Good itinerary and activities. 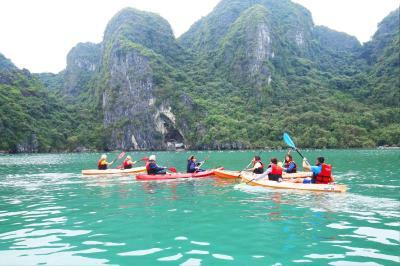 Loved the hike, kayaking and the cave exploration. Our guide Tony was fantastic, so charismatic and informative. The staff on the boat were super helpful, especially the bar stuff who hooked us up with some great cocktail deals. The destinations were beautiful, and the transfer was easy to organise. Food was very good and staff was nice and patient. The boat was very clean and tidy, the staff are very friendly and discipline and did their jobs perfectly, they are very smily and happy, The guide ( Hi) is super friendly and funny, Owen is nice and Tom the bartender is super cool,I highly recommend! 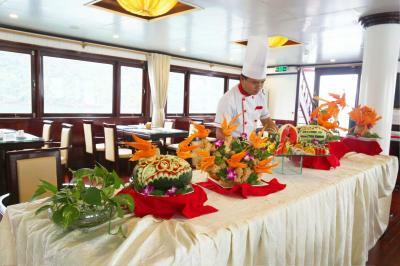 Staff, activities, meals. Terrace at the top. Cocktails. 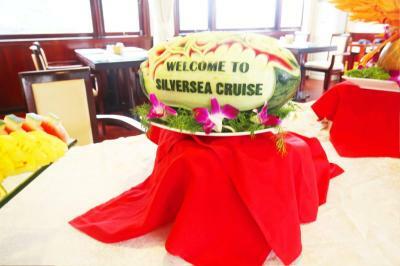 Halong Silversea Cruise This rating is a reflection of how the property compares to the industry standard when it comes to price, facilities and services available. It's based on a self-evaluation by the property. Use this rating to help choose your stay! 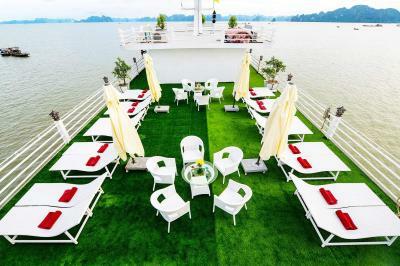 One of our top picks in Ha Long.Halong Silversea Cruise offers leisurely cruises and activities along Halong Bay. 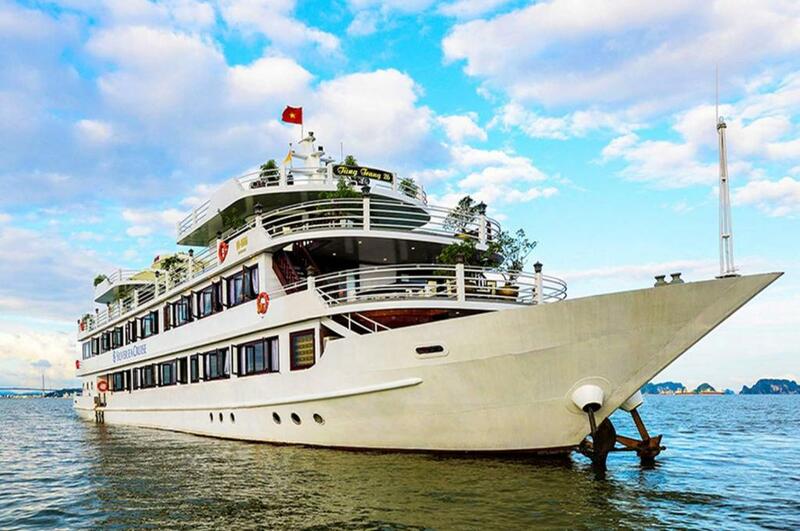 Featuring classically-elegant accommodations on board, Halong Silversea embarks from Tuan Chau Port, just 4.3 mi from Ha Long Night Market. 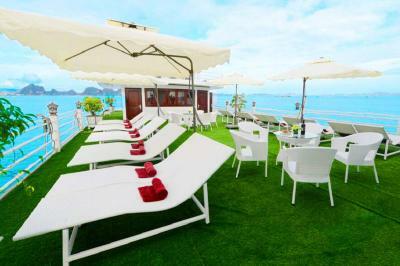 The cruise ship features a sun terrace, bar and an on-board restaurant.Free WiFi is available. Decorated in red-brown and white, each room comes with elegant interiors, with the welcoming bed decked in white, as a centerpiece. 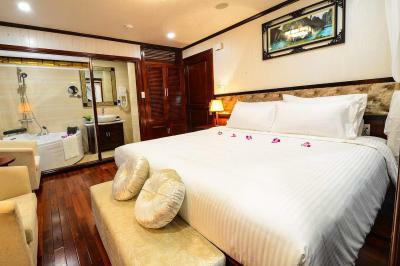 The air-conditioned rooms come fitted with a shower. Toiletries, towels and a hairdryer are provided. 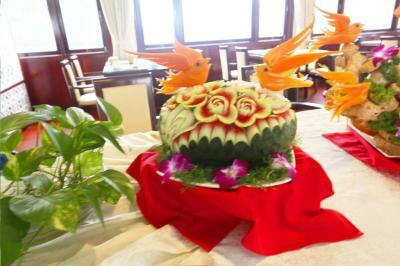 Guests can enjoy activities such as swimming and karaoke during the cruise. Tai Chi lessons and movie nights are also offered. 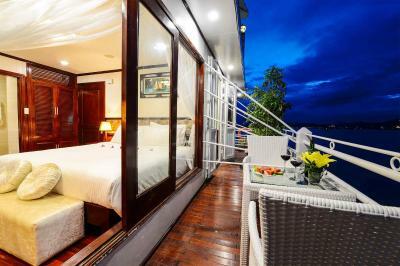 The nearest airport is Cat Bi International Airport, 19 mi from Halong Silversea Cruise. 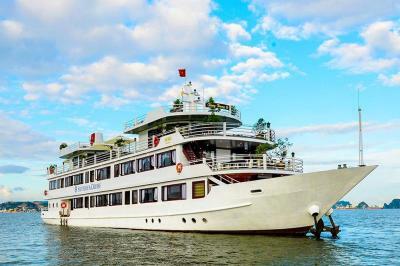 When would you like to stay at Halong Silversea Cruise? 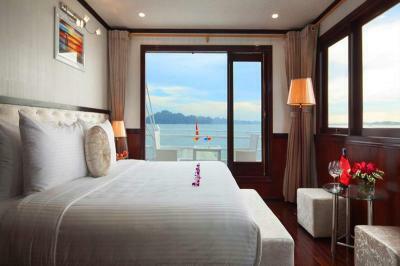 This room has air conditioning and a sea view. 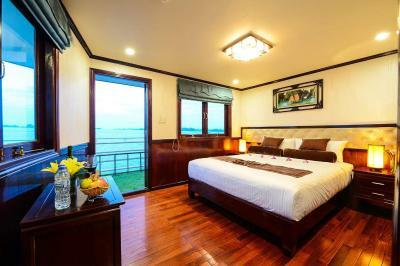 This room offers sea views and air conditioning. This room is soundproofed and offers a view. 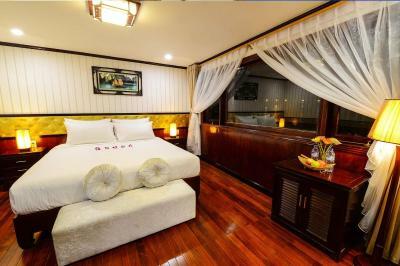 Accommodations in luxury boat cabin with air conditioning, with hot water. 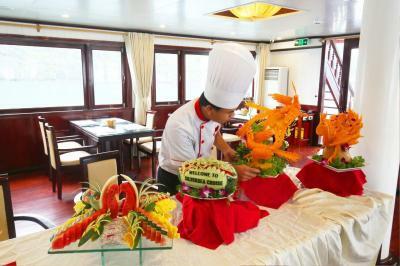 House Rules Halong Silversea Cruise takes special requests – add in the next step! 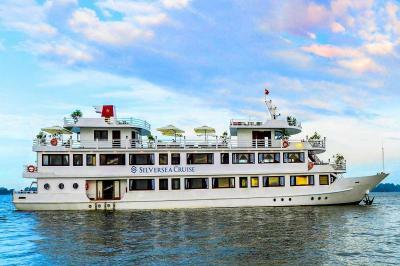 Halong Silversea Cruise accepts these cards and reserves the right to temporarily hold an amount prior to arrival. 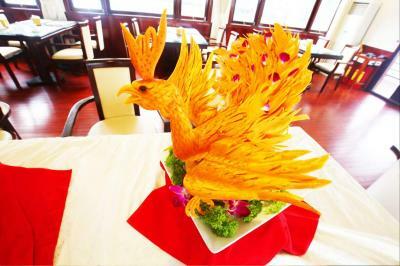 Transfer service from/to your hotel in Hanoi's Old Quarter Area is available at a surcharge. Kindly inform the property your hotel address, should you wish to utilize the service, via the Special Requests box or contact details found on your confirmation page. Guests who stay in other areas are requested to arrive at the reservations office at the address below at 7:45AM. 9 Hang Huong St.Hoan Kiem District,Ha Noi. - Children under 5 years sleep free of charge when using existing beds. - Children between the ages of 5 to 9 years are charged 75% of the rate of an adult when using existing beds. - Olden children are charged as adults when using existing beds. The wifi connection only available after 5pm in public area. The public area probably should be mentioned as Only in the restaurant or few meters within the restaurant compound. No connection in all the rooms as mentioned in the description but I think at least it is offered throughout the time when on board and not limiting for few hours only after 5pm to midnight. 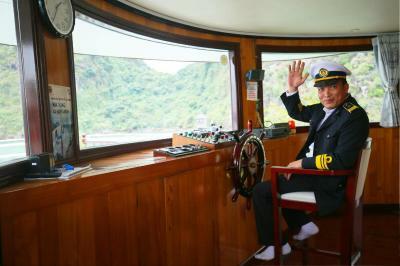 It was an awesome trip with Halong Silversea Cruise. I booked for a Deluxe room with balcony was a perfect choice where room comes with Jacuzzi bath tub! 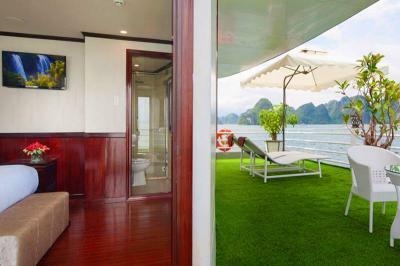 I have to emphasize and highly recommend to book the room with private balcony, because the view in Halong bay is EVERYTHING! 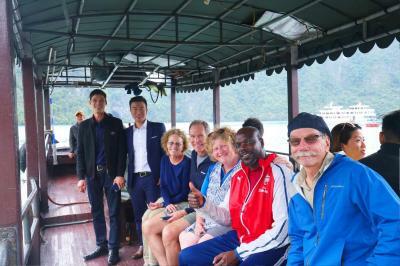 Our tour guide, Mr. Lucky was excellent in explaining and ensure we all are being well taken care throughout the stay. The food was good. We have 5 course meals for our lunch and dinner in day 1. 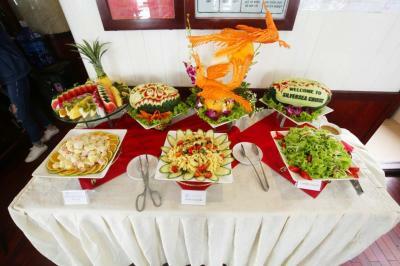 Breakfast and farewell lunch was served in buffet. 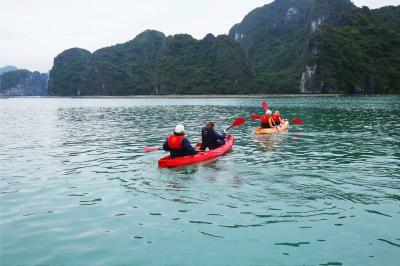 The activities arranged were great, no rush and the duration was just nice for every activities whereby you can have own leisure and relax time to enjoy your room facilities and also the magnificent view of Halong bay. (it is optional to participate or stay on board, it's up to you!) Another plus point that I would recommend Halong Silversea Cruise is the complimentary return transfer of Hanoi Old Quarter and the Halong bay port. You might find others offering lower rate but they are charging extra for the return transfer which is not inclusive in their rate which I found it not transparent during booking. Room was a bit smelly but expected on a boat! This cruise was just the best considering it’s one of the cheapest out there! I booked this cruise for me and my boyfriend on a bit of a tight budget but we were so glad we did! The staff were so inviting and so helpful/informative, Thu (Arthur) was the sweetest man who always asked how we were and if we needed anything along with always keeping us updated on what’s happening next etc. 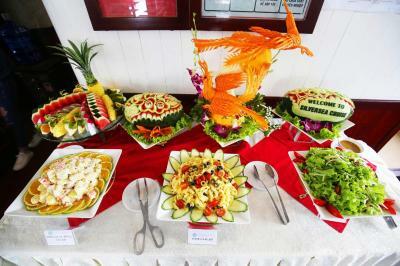 The food was also exceptional with lunch and dinner both being 5 course meals which catered for everyone! 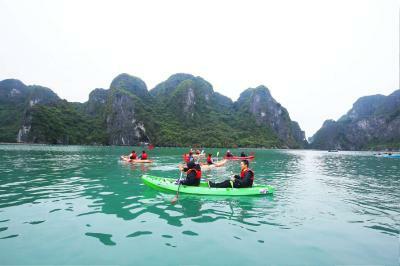 The activities are well planned and fun for everyone along with being a great way to fully experience Halong Bay. Although the boat isn’t the newest in the bay, it is spacious and attractive with everything you need, including very large rooms with big windows to take in the views! 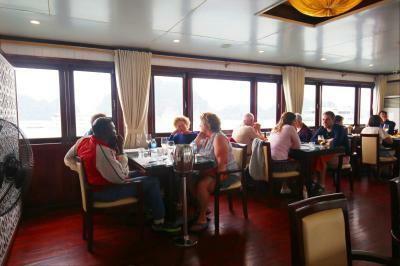 Would highly recommend anyone to use Silversea to have an amazing time in Halong Bay! As we had two nights, got to see much more with less crowds. Overnight park is Halong Car Park with boats everywhere, so noise from boats could be issue, but they seem to have agreements between all to reduce noise at about 10.00. Rubbish in water in such a unique place is disturbing. As we did 3 day 2 night, the second day was the real bonus as we went further out with less boats and less people, transferred to another boat with similar 3 dayers. 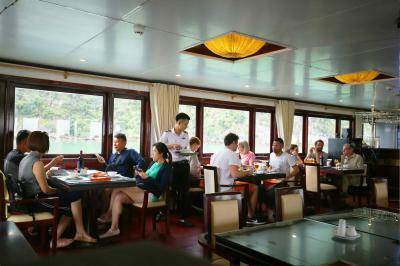 Daytrippers are on boat for 24 hours only and its pretty go, go, with little down time. 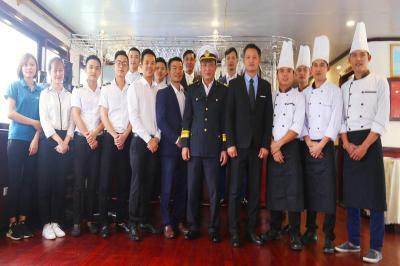 Food excellent, crew excellent. Very classy interiors overall, both rooms and dining area,. Reasonable priced drinks, good cocktails options. the boat is actually old. particularly, a whirlpool bath got stained with rusty water and didn’t work. when i turned it on, the water jets shot smelly water, which was so nasty and ruined my bath bomb — so sad. the ceiling is low and the shower is even lower, so i should bend my knees under the shower. great value for money. well-organized itinerary giving us enough time to enjoy each activity. food was good, too. 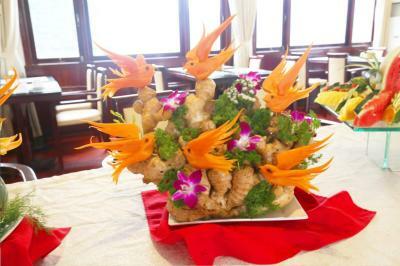 overall, it was an amazing experience to see such breathe-taking views on this nice cruise. definitely recommendable. From the moment that we set foot on the cruise we were treated like royals. The staff especially Arthur and Power were amazingly nice to us and everyone on board making sure that all of us are 100% satisfied. 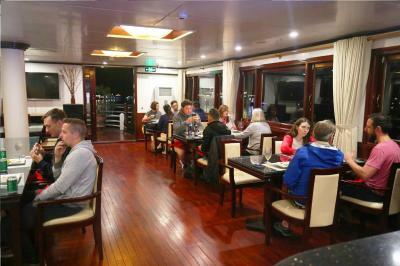 The atmosphere on board was extremely amazing and the food was real authentic vietnamese. Kudos to the chef. We can't thank them and praise them enough for the wonderful experience and amazing hospitality that we got. I would definitely In a heartbeat recommend your stay on this lovely cruise. They made our 3 day stay one that we can never forget. Thank you so much !!!! 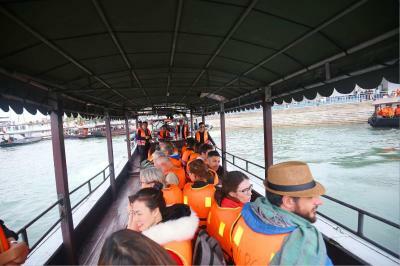 Offer free pick up from our hotel in Quarter Hoan kiem at 8.20am This was the best cruise I have ever experienced! The staffs were friendly and helpful. The services provided made us felt like we were VIP. We went on a 2 days 1 night cruise and we didn't regret one bit. The food was awesome too. They actually prepared 8 courses for our lunch and dinner, 8 courses EACH. And what's best? All of the courses were delicious! 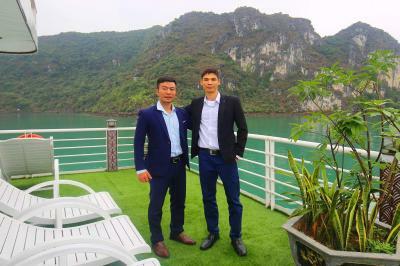 HaLong Bay was picturesque and totally worth our time and money Thank so much for Canh Le service, and all staff on boat, we has great time, will recommended this hotel to everyone. The room with balcony is roomy for 2. Nice window and balcony view. 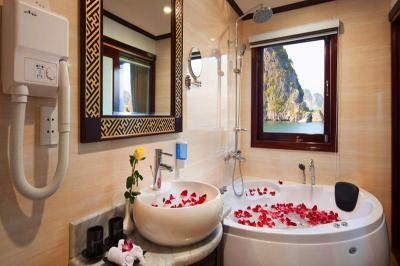 The bed is comfortable and there is a small jacuzzi bathtub. The cruise ship is midsize, good for small groups and families. Our local guide, Phong, is very fluent in English and he really take good care of us. To top mountain....way too crowded unfortunately. 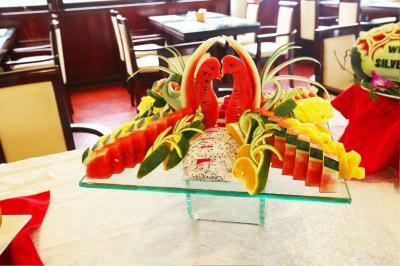 Plenty of delicious food and and beautifully presented. Liked that morning tours left s bit earlier to bypass the crowds. The staff was exceptional especially Power and Alex. They took great care of our rather large group. 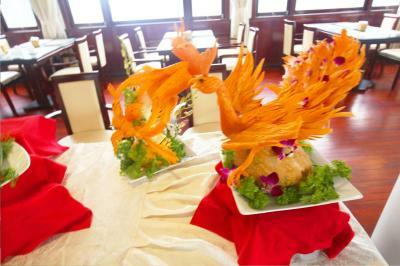 The food was outstanding and far exceeded our expectations. It’s very apparent the staff takes pride in what they do. There wasn't much free time/down time to enjoy the sun deck, terrace or any of the places where we stopped. 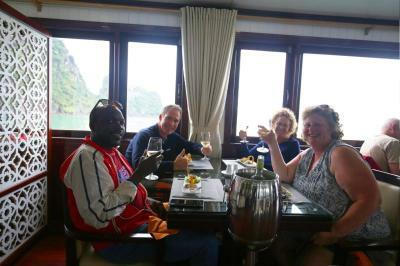 I understand that it's the nature of this type of cruise but I don't think we were well prepared beforehand and were surprised at how we had to rush from one activity to another and only have limited time to enjoy a particular stop. 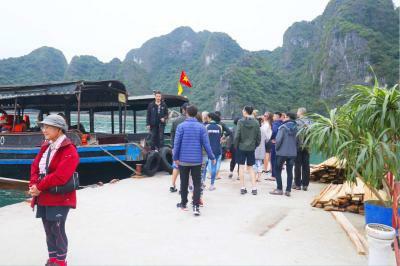 Halong Bay is overrun with cruises and tours, more can be done by the cruises to limit the use of plastic and waste. 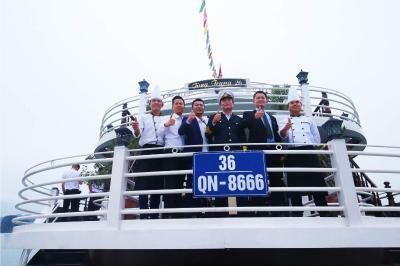 Also, the guests were given a number of rules and guidelines, the cruises should use that time to also educate guests to the impact their waste has. 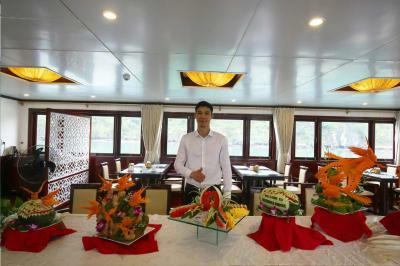 The staff on the boat were excellent, well presented and friendly. The first guide, Sui, was wonderful and offered interesting insights throughout our time. The food onboard was incredible!